This project has been lurking in the back of my consciousness for a while. After seeing pictures in several felt books, I was intrigued and a little intimidated, not sure how all of the little intersections would hold together. What better way to find out than to just try? Since this was my first attempt, it seemed appropriate to document the process, so everyone could share in my disaster or triumph, whatever it turned out to be. Wanting long pieces of roving for this project, I started with my finest combed merino, unrolling a beautiful ball and peeling thin pieces, which I laid out in a grid as long and almost as wide as my dining room table. After laying it out, I covered the roving with a sheer, nylon curtain I bought at Goodwill, then sprinkled hot soapy water on the wool, row by row. I worked each intersection for a few minutes before moving on to the next row. At this point, I started to worry whether I had gotten in a little over my head, starting a project so huge. When I reached the end, I peeled back the sheer curtain to examine the felt. While the pieces were not flying away, they weren’t really adhering either. I went back over each intersection with more soap, massaging vigorously and yet trying to preserve whatever gentle bond had begun to develop. 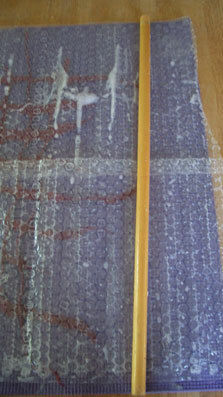 Next I layered sheets of bubble wrap over the wet wool and rolled it up in the yoga mat I used as my base. This bundle was rolled in a towel and secured with elastic bands. I rolled the towel bundle with my feet under my desk for twenty minutes, checking the progress once to ensure that the fibers weren’t being torn apart. I was amazed at how well the pieces held together. Normally, it is recommended that you turn your felt a quarter turn every few minutes to ensure that the piece felts evenly in all directions. Because my scarf was so long, I decide not to rotate it. 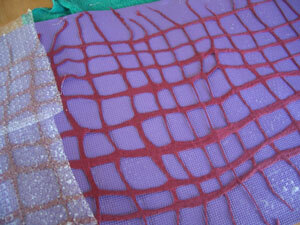 As a result, the short pieces running from top to bottom felted into little worms, while the horizontal pieces flattened. Looking closely, I found a few intersections that failed to felt properly, but I knew I could always needle them when it was dry. While it turned out just as I imagined, it didn’t really qualify as flashy. Sophie suggested needlefelting dots of color at the intersections. 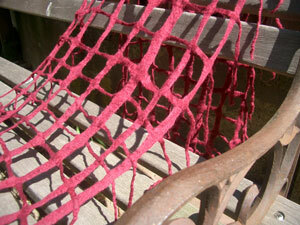 Like so many of my projects, this scarf was started because I needed something dashing to wear to a wedding. We were going away for four days without our children, and the drive was going to take at least five hours. I think I spent more time packing my handwork than my clothes. At my feet is a knitting bag with two projects, a drawer from my beading tower with wire, pliers and beads, and in my lap is a shoe polishing brush, roving and my needles. When we arrived at the hotel, I hung the piece from the mantel in our hotel room to determine whether the color dots were random enough. Our roommate walked in a day later and asked why I was taking pictures of a volleyball net. Hmmm. Not the expression I was hoping to hear. In the end, I decided the color didn’t really coordinate well with my dress, so I didn’t wear it to the wedding, though I did wear the necklace and earrings I made on the ride up just for the occasion. Sometimes things work just how you imagine, and sometimes it is just fun to experiment. That’s really nice, I love the coloured dots, and it looks great with the denim jacket. i like the little explosions of colour on the scarf. and thanks for the *nomination* a few posts back. i am humbled. I love it! I have never felted anything, but might try it now. I have a lot of large gemstone beads and wonder how it would work to sew them on the intersections? Though, I love the idea of keeping it light with the tiny felted dots! Wow! Now that is FAB-U-LOUS! I love the dots interspersed here-and-there. I have knit and felted some bags, but never something like this. It’s gorgeous. I wouldn’t have begun to know where to start. 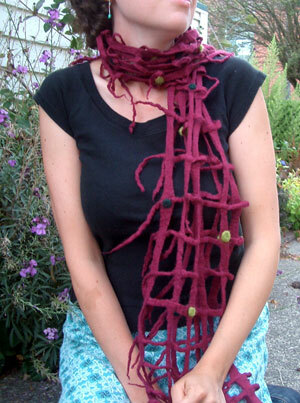 You won’t encounter very many people sporting a scarf like this. Fantastic! Very creative. Very nice documentation of the process. Very original … NOT very volleyball! I love it, Leah! Very fun project. I haven’t felted anything that large. My floor around me feet looked the same as yours when we left for our car trip this summer! Love it…and soooo huge! 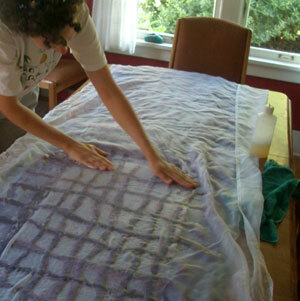 I am limited by the size of my felting table which is about 3 feet in diameter and a huge lab of white marble. Experimenting is what it is all about, isn’t it? 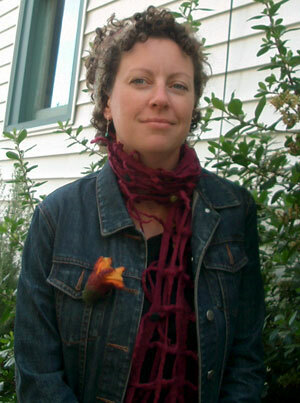 The scarf looks great with your denim jacket. 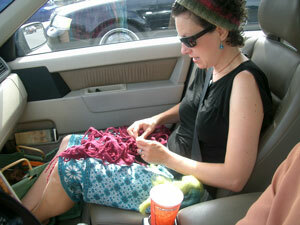 I love your blog, you’re so nice to share your projects thru writing and pics. 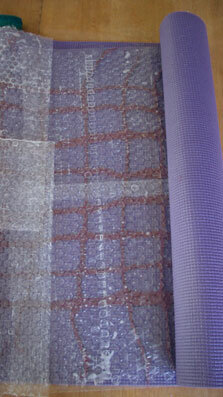 Your idea of using a yoga mat and rolling the piece with your feet under your desk are great. 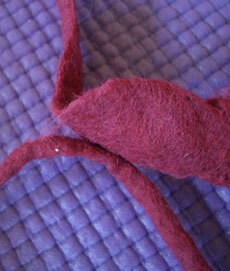 I’ve taken a few classes and now am starting to try felting on my own at home. Thanks for sharing your tips. Would love to see the earrings and necklace you made on the way to the wedding! This is great – I love it and the colours work really well too. I did an article on Craft Gossip about your scarf and hope you and your friends come and leave so comment. I love your blog and hope you link us up to you so others will come visit us. I thought it was great! 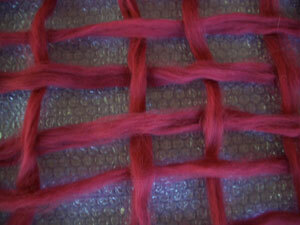 I was enjoying tying bits of my favorite yarn in a looseweave pattern like ths as well, and I love felting. Great idea! 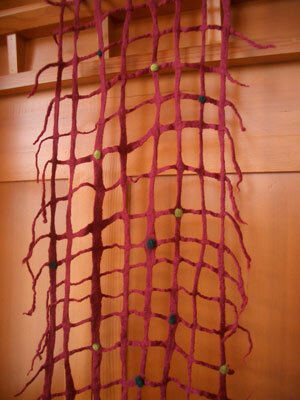 I want to try a scarf like this…so pretty!